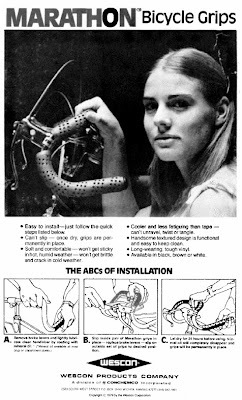 Cyclesnack: She has a grip on me! I would really like to track down the model used for this grip label and express my heartfelt thanks for the sincerity in her face that convinced me that I should use these grips on the Deathfork. Bike models from the 70's and 80's are inspiring! Just check out these from Lambert and Nishiki. What you can't tell in the black & white photo is that these grips are brown and will match perfectly with the Brooks B72 that I have on the Marin. As for the grips, I have two packs of these babies and plan on using them in some additional builds. They grips are really cool, they are a thick rubber that simulates leather tape. They would be perfect on bullhorns because you would only need two for the bars but the only drawback is you wouldn't be able to hide the cable through the tape. Looks like you just can't use these with aero levers.